Our Summer Camps keep your kids rockin' all summer long! Choose between our Little Rockers Camps (Ages 4-6), and our signature Junior and Senior Rock Band Camp (Ages 6.5-8 and 9-12). All camps are tailored to challenge music-lovers of any level, from those who have never played before to advanced. We specialize in empowering experiences that will last a lifetime! 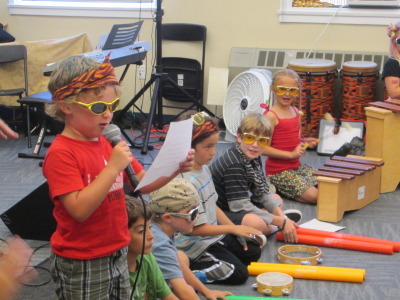 This is the perfect introductory camp experience for our youngest music-lovers. Campers will participate in making music in a nurturing and engaging environment while developing an understanding of the concepts of beat, pitch and rhythm. Our instructors will provide a full range of playful, educational selections of movement activities, high-energy games, arts and crafts, story times, entertaining songs, and hands-on instrument experience that will keep them movin' and groovin' all week long. Be a rock star for a week! 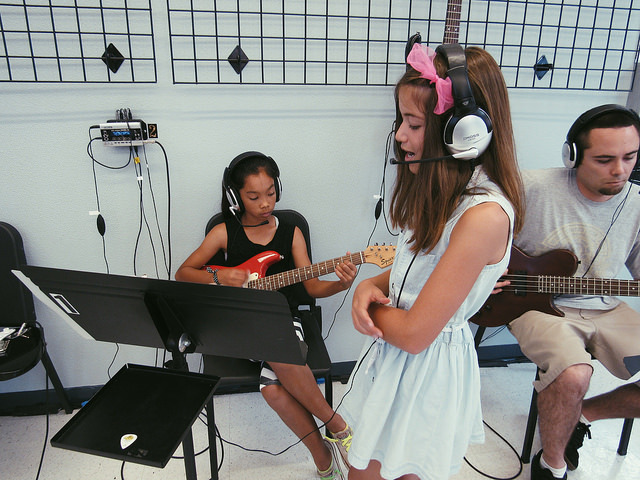 Rock Band Camp offers a sophisticated band experience for elementary through middle school students. No prior music experience necessary. Designed with a low student-to-staff ratio, campers learn the fundamentals of reading musical notation and charts. Through hands-on experience, campers will receive piano, guitar, drums, vocals and music theory to gain the skills necessary to play in a band with other musicians. See our school and music camps featured on Fox 5 Morning News! After the first day of Rock Band camp, my daughter professed her love for the drums. By the end of the week, the smile that I hadn't seen in a long time was back. As the summer went on, she kept begging to go back to RMC's Rock Band. My daughters had a wonderful time attending the Little Rockers camp. They played drums, piano and other instruments. Our son had such a fun time and enjoyed learning new songs during this week of camp. You have a great staff!